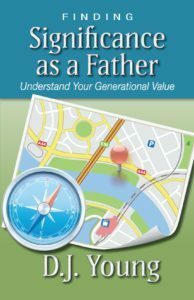 Finding your significance as a father suggests that your role in the life of your children is important and meaningful. Numerous studies prove that a Dad’s presence in the home positively affects his children’s social adjustment, school grades, morality, and choice of friends. On the sliding scale of a Dad’s influence on his children, his presence in the home has a highly positive effect on his children. If—statistically speaking—it is better to have a Dad in the home; does it follow that this man will find significance as a father? Not necessarily. Many factors come into play defining his significance and the contributions he makes in his role. What is significance? The dictionary defines it as “the quality of being important.” Synonyms in the Thesaurus are “meaning” and “importance.” What is meaningful and important, however, is in the eye of the beholder. How, then, can a Dad find significance in being a father to his children? What can he use as a measuring stick, a scale or a test to measure his value and give him a sense of significance, meaning, and importance? It must be externally evident. As a wooden ruler has the numbers on the outside, so the measuring stick for significance as a Dad must be evident on the outside. He cannot hide it and then suddenly surface as Dad of the Year. It must be a pattern, which others can observe and adopt. Whatever the frame of reference, it cannot describe just one Dad. Being a Dad is the universal role of any man who has children. Commonality is the rule, not the exception. It should be simple in nature and scope. A Dad spends much of his life providing for his family. He spends approximately one-fourth of his week working outside the home. On the average, he sleeps one-third of his week. If he works more than forty hours a week and sleeps less than eight hours a night, the time available for his family is around fifty percent of the week. Subtract from that the time he spends on maintaining the house, car repairs, overtime at work, eating, attending to general family needs, personal activities, rest and relaxation times. It must be universal in its application. Other Dads must be able to apply the rules and tenets of this measuring stick. How intrinsically different can one Dad’s life be from any other Dad’s? He is mainly unique in his particular expression of love, affection and involvement with his children. It must have proof of uniqueness. Who wants to go where no Dad has gone before? Most Dads accept the role of being a father and being significant in their children’s lives. But many don’t understand how this gives them personal significance. in being a father to his children? Significance defined on a personal, private and profound level. One Dad may find it highly significant that he is one sibling out of nine, that he is not an alcoholic and that he has successfully avoided his biological family’s modes of operation. Another Dad’s significance may be the result of his level of education, amount of income, social status and/or amount and value of possessions. How often do you hear a Dad speak of any level of significance when he appraises his fatherly qualities? Usually he buries such thoughts deeply and just wonders at times how he is doing in the hierarchy of his family’s structure and values. Although he may long for significance as a Dad, he most likely finds it in his career, not in his being a Dad even though his role as Dad weighs more heavily on his heart and mind and on his fear of failure. After all, in his child’s life, there is only one Dad and he is it. Others share the same type of work with him. Many men share their love for sports. But he is the only one who puts his life on the line for his children. He wakes up with his children’s welfare on his mind and often goes to sleep pondering how to make things better for each of them. His role as Dad occupies his heart, mind, and emotions. I am the Dad of five adult children. Many times I have been reminded that Moms can turn to a lot of resources, which Dads don’t have. Moms can even participate in programs when things are going well for them while Dads often reach out only after a problem can’t be resolved, such as a divorce, a problem teen, inadequate finances, or the proverbial asking for directions on a trip. finding Significance as a Father.